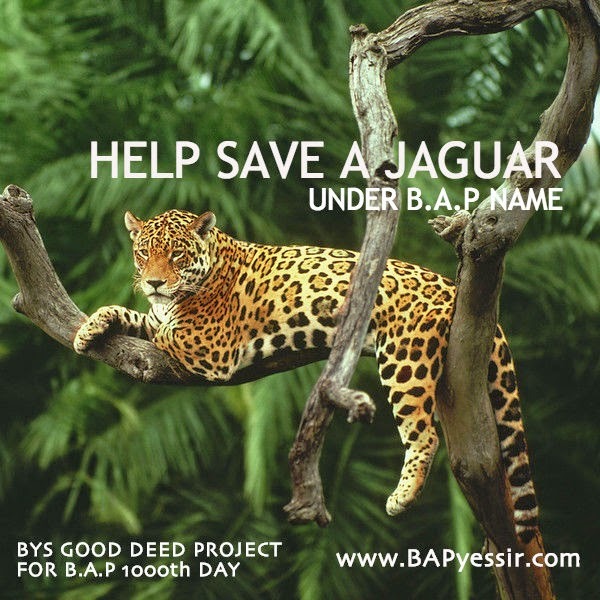 BYS: [B.A.P's 1000 Days PROJECT] EARTH NEEDS YOU! Volunteer or Donate Under B.A.P's Name! 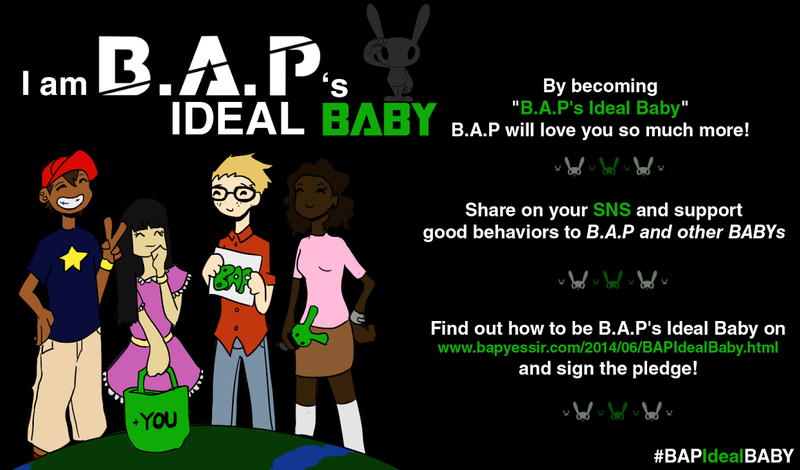 [B.A.P's 1000 Days PROJECT] EARTH NEEDS YOU! Volunteer or Donate Under B.A.P's Name! For B.A.P's 1000th day, let's show them how they made a difference in our life and how they inspired us! Instead of sending B.A.P tons of gifts, let's help our planet and people in need. B.A.P are insanely busy with concerts, broadcasts and working on new albums. Although they probably appreciate to receive fangifts and fanletters, we know that they receive too much stuff everyday. But there's other way to show our support and love to B.A.P. Give your time to elderly, children, abandoned animals or other. Through 2014, become a good samaritan by following B.A.P's inspirational footsteps to make the world a better place. We will include each fans "good deeds" report in an e-photobook (video) that we will send to B.A.P. 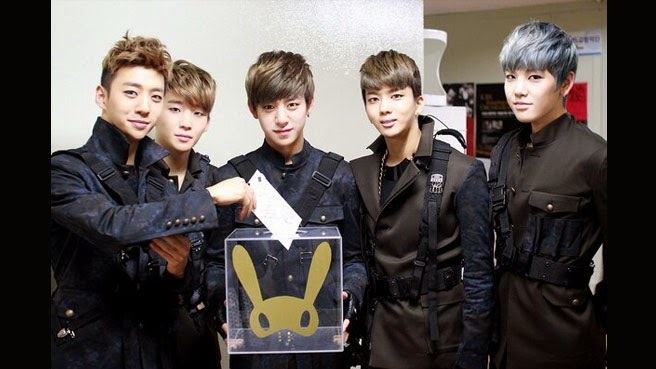 Make B.A.P proud on their 1000th day! 2. Join BYS "Wildlife Adoptions for a Living Planet" sub-project: EARTH NEEDS YOU! GREATER GOOD: Purchase clothes and jewelry on Greater Good's shop site (every purchases gives to a cause you choose: fighting famine, funding diseases researches, helping animals in shelters, giving the opportunity to poor children to go to school, and protecting the planet). VOLUNTEER for hospitals, animal shelters, senior homes, schools/day cares/after school centers, Red Cross, soup kitchens for homeless and needy, women and children's shelters, garbage clean ups, etc. GIVE food, clothing, toys, blood, or hair to those in need. Any other idea that you think would be good and help someone or a cause in any way. You can submit more than 1 good deed: The more we receive, the better! Remember, our goal is to collect 100 good deeds stories from international fans! Fill up the form below and send it to BYSFANSITE@GMAIL.COM with the subject "Good Deeds"
Attach a picture: If you did an activity, attach a picture of you doing the activity. If you donated to a cause, or purchased something to sponsor a charity, take a selca with a certificate of donation or your purchase! ☆ Your picture, name and country will be included in a small book that will be given to B.A.P with the memory box. It will also be included in our Good Deed video. The e-photobook will include all BYS charity projects for B.A.P: Planting Peace, Brain Tumor, UNHCR, UNICEF, Greater Good, World Wide Hearing, Stop Hunger Now, DREAME KR and many others through collaboration projects. Protecting endangered species might sound useless, but it's not! Important species such as the tiger or the shark regulates the planet's ecosystems that provides humans with food, water and fresh air. More than 2,000 species disappear each year because of human's pressure on the environment. Nature sustains all life on Earth, and the protection of the wildlife has a direct impact on the survival of ALL of us. All adoption will help the world's biggest conservation organization, the World Wildlife Fund (WWF) to create a future for people to live in harmony with nature. Your name + B.A.P name will be on the certificate AND you will receive the adoption kit by mail, which includes: The official certificate of adoption, a plush and a photo of the animal. Your name, country and adoption will be mentioned in our e-photobook. If you'd like to, we can also include a selca of you holding the certificate! The certificate of each adoptions will be included in the e-photobook. 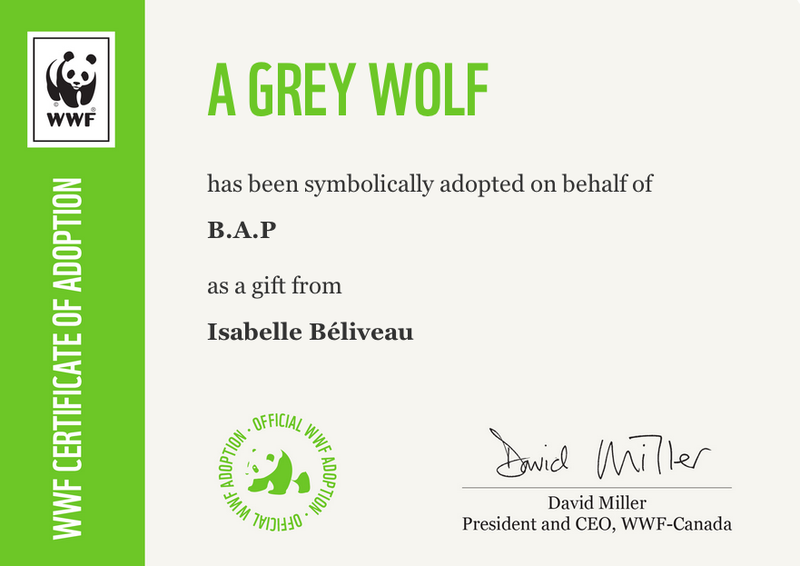 Remember: A $ 50 + USD donation will allow you to fully adopt an endangered animal under B.A.P's name. All donations under $ 50 USD will be used for our Combined Adoptions. If the link doesn't work, please click [HERE]. When you are done sending your donation, please fill up the form below. If you can't see the form, follow this [link]. Thank you so much for joining our project! The video, small book and memory box will be sent to B.A.P a week before October 23, 2014. Can't seem to find form either?? Can we submit more than 1 good deed? You have too many projects going on at once. I work in the nonprofit sector and it's just too much, you should focus your energy and write a more clear concise summary. We actually sponsor two charities only, one concerning the environment, the other concerning people. Why is that too much? Please give us advices on how to concise more our project. It's stated up there "1. Do good deeds and submit your story before October 2014"
I was wondering how do I donate as a group to reach to $50 for wildlife adoption? You don't adopt a particular animal. Your 'symbolic' adoption will help the organization to preserve the habitat of the animal, and that will contribute to save an entire population. We are working with WWF Canada. An adoption is 40 CAD, and at BYS we ask for 50 CAD to cover shipping fees to the adoptant's house. 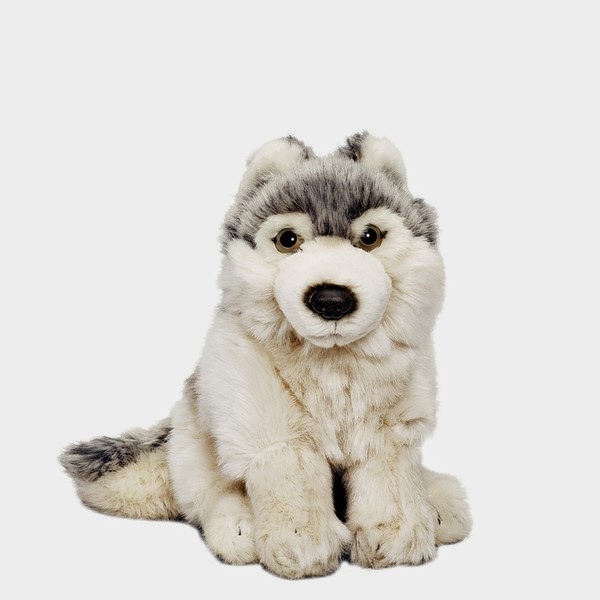 The donation includes a stuffed animal, a certificate and a poster of the animal. If you have any further question, please ask at bysfansite@gmail.com, thank you! what if i do an activity, but i don't have the picture, is it okay? Is it okay if I send in my deed on Oct 1st? Or are you not accepting anymore that day?